The graceful Common kestrel (Falco tinnunculus Linnaeus, 1758) is an elegant falconet belonging to the order of the Falconiforms (Falconiformes) and to the family of the Falconids (Falconidae) where converge all those raptors that, as indicated by the etymology of the genus Falco, have falcate wings, sickle-shaped, from the Latin “falcis” = sickle. Also the specific name tinnunculus comes from the Latin = jingle, an onomatopoeic reference, seen that its usual cry imitates the jingling of a bell. This much known and particularly present in the anthropized European areas sound, has conditioned various vulgar names among which the English term “kestrel” nowadays used world-wide to indicate small raptors with these characteristics even if belonging to different species. 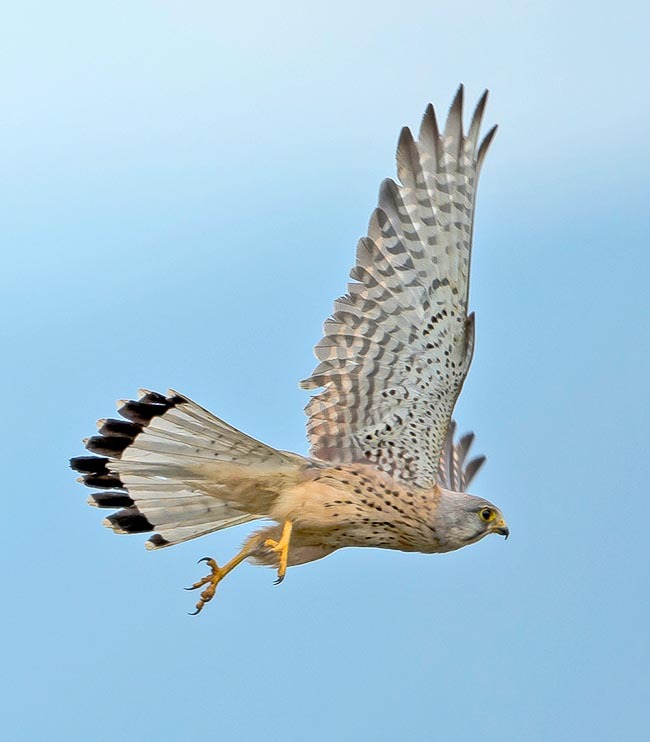 It seems that the term “kestrel” is a corruption of the archaic French “créssele”, in turn derived from the Latin crepitare, rightly an imitation of its sound. If we had to descrive the common kestrel with one only reference or on particular that renders it identifiable without any hesitation from all its consimilar birds of prey, that would be an easy game and there should be any hesitation. The Holy Spirit, the typical hovering staying perfectly still in mid-air, practiced by this bird almost continuously during its searching for preys. 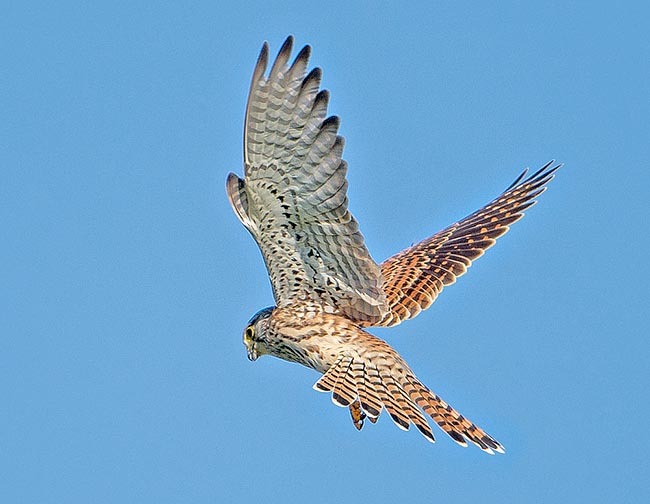 A flight that does not go unnoticed especially since the common kestrel does it continuously during the day and anywehre, particularly when a light breeze blows helping it in keeping more nimbly in flight. From the open country, to median strips, from the parks to the yards of the farmsteads, from the ample parkings of the commercial centres to the suburban football fields. So much so that in the vulgar names of all the world inhabited by it, this particular attitude is taken. Infinite are the nicknames used to describe ot, but always referred to its way to deal with the wind: cacciavento, cernivento, cazzicaventulou, windhover, tunnel. 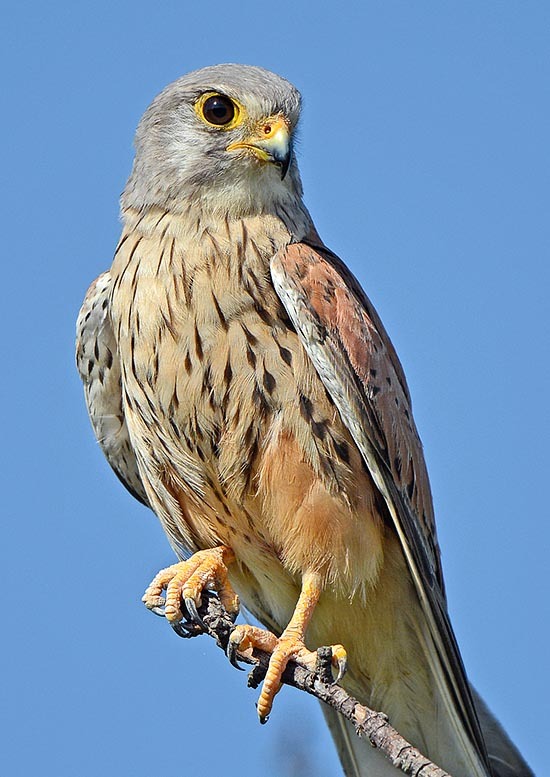 In Europe it is usually called Faucon crécerelle in French, Cernícalo vulgar in Spanish, Turmfalke in German, Peneireiro-vulgar in Portuguese and rightly Kestrel in English. The common kestrel is now an anthropized bird and closely linked to the human activities and is now a constant presence around our dwellings. If we then consider that it loves to build the nest in the garrets, on the bell towers and on the old historical monuments, we get the confirmation of its closeness to our everyday life. The Falco tinnunculus has an extremely vast distribution covering the whole Europe, Asia and Africa, but avoids the deserts, thick forests and arctic zones. In Asia is not present in Indonesia, its extreme limit in the diffusion in this continent whilst in Europe is by sure the most diffused and common raptor. It is fiund up to 5000 m of altitude. The kestrels usually are on the contrary diffused in all the continents but the extreme Arctic and Antarctica. About fifteen species have been identified very similar each other and with the same behaviours but assigned duly and since time to separate species. Some have a shared territory and in these places often is not easy to make a neat distinction among them. Our common kestrel is, for instance, rather similar to the Lesser kestrel (Falco naumanni) with whom it shares the Mediterranean part of the range and only experienced eyes are able to recognize at once the difference between the two species. It is usually a sedentary bird but some populations are subject to seasonal migrations in relation with the atmospheric variations and to the food availability. Sometimes this migration, in particular the European one, may reach the sub-Saharan zones. The strong versatility shown by this raptor has led it to frequent and adapt to a remarkable variety of habitats, from pre-desertic areas to stony and arid hills, from villages and cities to the open country, from city parks to the margins of wooded areas but when it feeds it needs areas free from every hindrance and covered by very low vegetation in order to render visible the searching of its preys. Besides practicing the Holy Spirit, it spends the rest of the day waiting for the preys staying perched on the wires of the electrical energy, on the roofs of our dwellings and on any other support from where it can dominate an underlying open area waiting to loot. 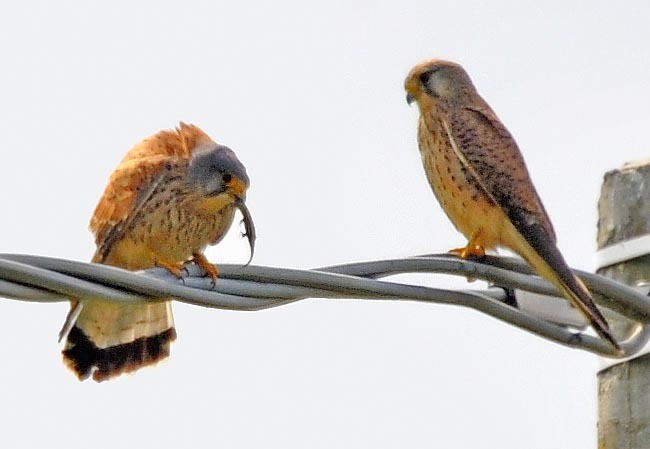 The common kestrel nourishes of small preys going from coleopterans to small rodents, from lizards to earthworms, from small passeriforms to mice and perhaps this is the reason for which it spends so much of its time devoting itself to hunting. At times it seems that it enjoys eating for hours small insects assuming a rather reduced quantity of food and maybe even not sufficient to replace the energy consumed for the long time spent flying mid-air. Once the digestion is completed, the common kestrels expel small wads where are enclosed hairs, small bones and elytra of coleopterans. Occasionally the common kestrel is used also in the falconry but more as raptor for demonstration and for its elegance and loveliness than for its predatory activity. Often the common kestrel is mobbed by the crows even if at times it would seem that it is the one disturbing them but in its turn loves to use the same technique towards the buzzards when they fly up on its territory even if it appears that more than a disturb it wants to play with them. The common kestrel is typically a small falconet with reduced and slender dimensions. Its wingspan is just over the 70 cm, the weight barely reaches the 250 g and the length 35 cm. There is a remarkable sexual dimorphism between the two sexes with the female being slightly bigger than the mail but with a quite different livery. The adult male evidences a rump and the alar coverts of hazelnut colour, marked by big blackish spots, the black remiges, the ash grey head, the chest of cream colour spotted with small dark drops that are evident also on the underwing and a pair of very black mustaches going down vertically on the neck whilst the female results darker and uniformly spotted on the rump as well as on the chest. Both have a pronounced tail, totally ash grey for the male with a showy black bar in the terminal part whilst for the female its barred several times in black on a pale brown background. The tail feathers are fanned with the central ones more elongated and the lateral ones progressively shorter. The young are similar to the females with less evidenced facial drawings and bare part of the fazce of light bluish greyish colour. 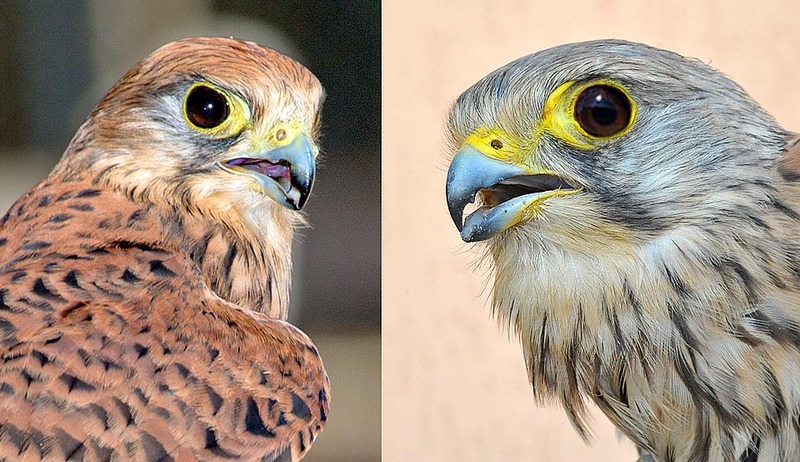 In the adults the cere, the ocular ring and the legs are of straw yellow colour and the claws are black unlike the lesser kestrel who has them white. These birds have a very sharp eyesight. It has been written that they can see also the ultra-violet, in a so much efficient way to notice the urine markings of the small rodents it is able to follow into the grass till when it finds the preys. So it is no wonder to see them descovering a small insect even 50 m far away. To this we have to add the possibility to move the neck still by turning the head almost totally on itself, typical characteristic of these falconids that have a greater number of cervical vertebrae than other raptors. 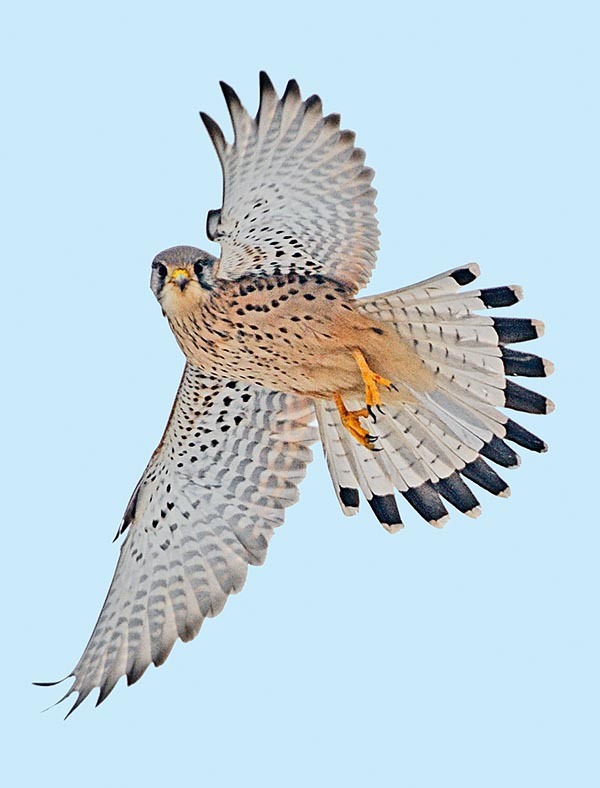 In Europe the common kestrel begins in spring to court the partner by continousouly flying on the chosen territory and emitting that squeaky tinkle that has given it the name. It makes pirouettes even at remarkable altitudes twirling in cose circles and keeping the position on the underlying territory. Often the female joins the flight and the male courts her by deliberately dodging the partner several times and incessantly, before going back then with a strong swoop to the place selected for the nest. Whatever the choice of the nesting site is, a real nest is never built. When in the open countryside, are occupied old nests of crows or holes in rocky walls but usually the choice falls on old buildings, belfries, dormers and attics, windows surrounds and any other corner offering simply a minimum space where to spawn, often competing, when in anthropized places, with the nowadays omnipresent rock doves. It does not disdain the use of artificial nest boxes. Any material is not brought for lining the nest and the eggs are therefore laid directly on the bottom but by the end of the nidification the same will be completely covered by the small wads regurgitated by the chicks during their growth. It lays 4 to 6 and at times 7 whitish eggs strongly amber red spotted that are hatched for about 30 days, usually only by the female, to whom the male carries the food. As every two days one egg is laid, at the time of the birth the chicks have quite different ages among them with variations that may be quantified even in a difference of fifteen days. 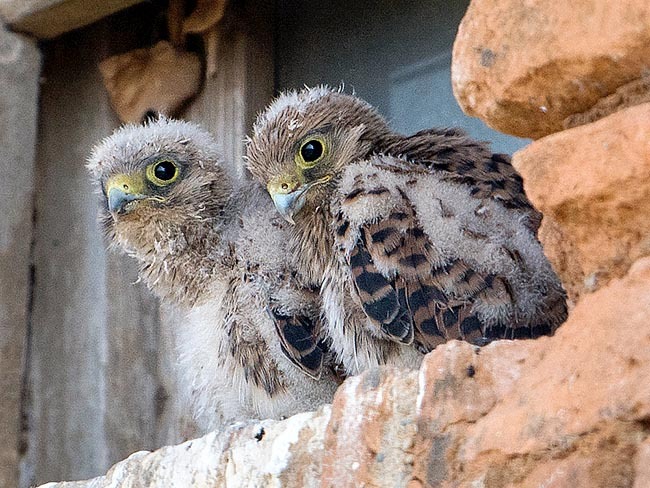 During the four weeks of growth usually do not occur cainism cases as the common kestrels, being wily hunters and adapting to many typologies of feeding, are always able to satisfy the atavistic hunger of their progeny. The young leave the nest after four weeks but for a long time they live with and depends from the parents coming often back to sleep in the same nest. In this period it is easy to observe whole families hunting together and sharing the same territory. The common kestrel is monogamous during the nesting but does not bind with the same partner the whole life changing usually it in every season. The sexual maturity is reached already on the second year of age but usually the first nidification takes place during the third year. The lifespan may reach the 15 years. The common kestrel doesn’t have particular predators when adult but the nests are at times predated during the day by sparrow and goshawks and by night by tawny or eagle owls. Extremely common and constantly increasing bird, it enjoys in the entire range a high status of security.